Spectroscopic observations from the James Webb Space Telescope (JWST) will be a powerful tool for probing the physics of galaxy formation. Emission-line measurements will provide important diagnostics of galaxy chemical composition, star-formation rates, feedback, stellar populations, and photo-ionizing continuum escape. Recent spectroscopic observations of high redshift galaxies have revealed that new ingredients are required to model the spectral energy distributions of low metallicity galaxies, and to interpret the nebular spectra observed in the extreme emission-line galaxies. New spectral diagnostics based on rest-frame UV and optical emission lines have been developed that can take advantage of the wavelengths accessible for JWST spectroscopy of galaxies at z>7. There has been progress made on calibrating indirect probes of the conditions that facilitate the escape of ionizing photons using local galaxies. At the same time, theoretical studies have made significant advances in modeling the feedback and outflows in galaxies, and radiative transfer in the IGM at early epochs. 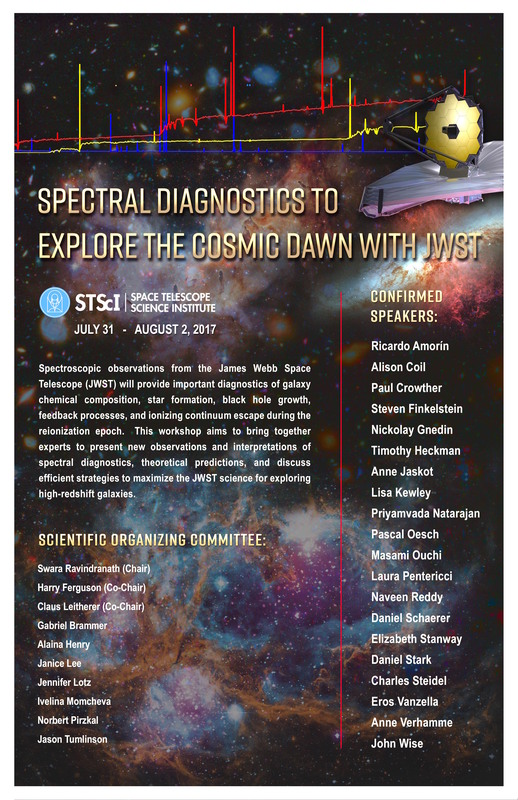 This workshop aims to bring together expert observers and theorists to discuss the spectral diagnostics and efficient strategies to maximize the JWST science for exploring high-redshift galaxies. The workshop will include invited talks, contributed talks, and posters. On the last day of the workshop there will also be breakout sessions scheduled to demonstrate JWST proposal planning tools (APT, ETC) and data analysis tools to help with the JWST observation planning. The Institute will provide morning and afternoon refreshments during the Workshop. Lunch from our on-site café, Azafran will be available at your own expense ($14.75/day) each day of the Workshop. On Tuesday, August 1, 2017, we will host a reception and dinner at Gertrude's Restaurant in the Baltimore Museum of Art. The special room rate will be available until 6/24/17 or until the group block is sold-out, whichever comes first. Click on the Practical Information Tab at the top left of the website. Click the word Hotel on the left and that will bring you to the hotel reservation information page.